VerizonCompany: Verizon Communications Inc.Brand Value: $86,948 MillionHeadquarters: New York, NYCat..
Coca-ColaCompany: The Coca Cola CompanyBrand Value: $76,388 MillionHeadquarters: Atlanta, GAIndustry..
UPSCompany: United Parcel Service Inc.Brand Value: $56,614 MillionHeadquarters: Atlanta, GACategory:..
DisneyCompany: The Walt Disney CompanyBrand Value: $56,303 MillionHeadquarters: Burbank, CACategory:..
Wells FargoCompany: Wells Fargo & CompanyBrand Value: $55,268 MillionHeadquarters: San Francisco..
General ElectricCompany: General Electric CompanyBrand Value: $46,435 MillionHeadquarters: BostonCat..
StarbucksCompany: Starbucks CorpBrand Value: $46,071 MillionHeadquarters: Seattle, WACategory: Fast ..
XfinityCompany: Comcast CorpBrand Value: $44,758 MillionHeadquarters: PhiladelphiaCategory: Telecom .. The Home DepotCompany: Home Depot Inc.Brand Value: $41,866 MillionHeadquarters: Atlanta, GACategory:..
SpectrumCompany: Charter Communications Inc.Brand Value: $41,239 MillionHeadquarters: Stamford, CTCa..
NikeCompany: NIKE Inc.Brand Value: $34,295 MillionHeadquarters: Beaverton, ORCategory: ApparelYear f..
AccentureCompany: Accenture PLCBrand Value: $28,410 MillionHeadquarters: Dublin, IrelandCategor..
BudweiserCompany: Anheuser-Busch InBev SABrand Value: $28,029 MillionHeadquarters: Leuven, Belg..
American ExpressCompany: American Express CompanyBrand Value: $27,697 MillionHeadquarters: New ..
WalmartCompany: Wal-Mart Stores Inc.Brand Value: $27,585 MillionHeadquarters: Bentonville, Arka..
OracleCompany: Oracle CorpBrand Value: $25,370 MillionHeadquarters: Redwood City, CAIndustry: Techno..
PayPalCompany: PayPal Holdings Inc.Brand Value: $23,190 MillionHeadquarters: San Jose, CACategory: P..
IntelCompany: Intel CorpBrand Value: $22,790 MillionHeadquarters: Santa Clara, CACategory: Technolog..
PampersCompany: The Procter & Gamble CompanyBrand Value: $22,000 MillionHeadquarters:..
YouTubeCompany: Alphabet Inc.Brand Value: $20,380 MillionHeadquarters: San Bruno, CACategory: Techno..
CitiCompany: Citigroup Inc.Brand Value: $20,316 MillionHeadquarters: New York, NYCategory: BanksYear..
SubwayCompany: Doctor's Associates Inc.Brand Value: $19,529 MillionHeadquarters: Milford, C..
ColgateCompany: Colgate-Palmolive CompanyBrand Value: $18,273 MillionHeadquarters: New York, NY..
ExxonMobilCompany: Exxon Mobil CorpBrand Value: $18,212 MillionHeadquarters: Irving, TXCategory..
CiscoCompany: Cisco Systems Inc.Brand Value: $17,701 MillionHeadquarters: San Jose, CACategory:.. US BankCompany: US BancorpBrand Value: $17,185 MillionHeadquarters: Minneapolis, MNCategory: Ba..
T-Mobile USCompany: T-Mobile US Inc.Brand Value: $16,926 MillionHeadquarters: Bellevue, WACateg..
CostcoCompany: Costco Wholesale CorpBrand Value: $16,785 MillionHeadquarters: Issaquah, WashingtonCa..
ChaseCompany: J.P. Morgan Chase & Co.Brand Value: $16,687 MillionHeadquarters: New York, NYCateg..
GilletteCompany: The Procter & Gamble CompanyBrand Value: $15,921 MillionHeadquarters: BostonCat..
MorganCompany: J.P. Morgan Chase & Co.Brand Value: $15,871 MillionHeadquarters: New York, NYCate..
NetflixCompany: Netflix Inc.Brand Value: $15,676 MillionHeadquarters: Los Gatos, CA Category: Techno..
LinkedInCompany: Microsoft CorpBrand Value: $14,744 MillionHeadquarters: Mountain View, CACategory: ..
AdobeCompany: Adobe Systems Inc.Brand Value: $14,265 MillionCategory: TechnologyHeadquarters: San Jo..
SalesforceCompany: salesforce.com, Inc.Brand Value: $14,222 MillionHeadquarters: San Francisco, CACa..
Bank of AmericaCompany: Bank of America CorpBrand Value: $13,657 MillionHeadquarters: Charlotte, NCC..
SprintCompany: Sprint CorpBrand Value: $13,316 MillionCategory: Telecom providersHeadquarters: Overl..
eBayCompany: eBay Inc.Brand Value: $12,962 MillionHeadquarters: San Jose, CACategory: RetailYear for..
KFCCompanies: Yum! Brands Inc. & Yum China Holding IncBrand Value: $12,895 MillionHeadquarters: ..
FordCompany: Ford Motor CompanyBrand Value: $12,813 MillionHeadquarters: Dearborn, MICategory: CarsY..
HPECompany: Hewlett Packard Enterprise CompanyBrand Value: $12,794 MillionHeadquarters: Palo Alto, C..
PepsiCompany: PepsiCo, IncBrand Value: $12,746 MillionHeadquarters: Purchase, NYCategory: Soft drink..
HPCompany: HP Inc.Brand Value: $12,434 MillionHeadquarters: Palo Alto, CACategory: TechnologyYear fo.. DISH NetworkCompany: Dish Network Corp.Brand Value: $12,117 MillionHeadquarters: Meridian, COCategor..
Lowe'sCompany: Lowe's Cos Inc.Brand Value: $12,115 MillionHeadquarters: Mooresville, NCCateg..
CamelCompanies: British American Tobacco PL and Japan Tobacco Inc.Brand Value: $11,076 MillionHeadqu..
SnapchatCompany: Snap Inc.Brand Value: $10,845 MillionCategory: TechnologyHeadquarters: Venice, CAYe..
DeltaCompany: Delta Air Lines Inc.Brand Value: $10,557 Million Headquarters: Atlanta, GACategor..
WalgreensCompany: Walgreens Boots Alliance Inc.Brand Value: $10,200 MillionHeadquarters: Deerfield, ..
State FarmCompany: State Farm Mutual Automobile CompanyBrand Value: $10,014 MillionHeadquarters: Blo..
HiltonCompanies: Hilton Worldwide Holdings Inc., Hilton Grand Vacations Inc.Brand Value: $9,824 Mill..
Morgan StanleyCompany: Morgan StanleyBrand Value: $9,775 MillionHeadquarters: New York, NYCategory: ..
American AirlinesCompany: American Airlines Group Inc.Brand Value: $9,586 MillionHeadquarters: Fort ..
CVSCompany: CVS Health Corp.Brand Value: $9,109 MillionHeadquarters: Woonsocket, RICategory: RetailY..
7-ElevenCompany: Seven & I Holding Co., Ltd.Brand Value: $9,036 MillionHeadquarters: Irving, TXC..
L&MCompanies: Altria Group Inc., Philip Morris International Inc.Brand Value: $9,022 MillionHead..
InstagramCompany: Facebook Inc.Brand Value: $8,732 MillionHeadquarters: Menlo Park, CACategory: Tech..
Goldman SachsCompany: Goldman Sachs Group Inc.Brand Value: $8,700 MillionHeadquarters: New York, NYC..
ChevronCompany: Chevron Corp.Brand Value: $8,482 MillionHeadquarters: San Ramon, CACategory: Oil &am..
TeslaCompany: Tesla Inc.Brand Value: $8,319 MillionHeadquarters: Palo Alto, CACategory: CarsYear for..
Lay'sCompany: PepsiCo Inc.Brand Value: $8,239 MillionHeadquarters: Plano, TXCategory: Food &..
SouthwestCompany: Southwest Airlines Co.Brand Value: $8,140 MillionHeadquarters: Dallas, TXCategory:..
PNC BankCompany: PNC Financial Services Group Inc.Brand Value: $8,108 MillionHeadquarters: Pittsburg..
TideCompany: The Procter and Gamble CompanyBrand Value: $7,945 MillionHeadquarters: Cincinnati, OHCa..
TargetCompany: Target Corp.Brand Value: $7,517 MillionHeadquarters: Minneapolis, MNCategory: RetailY..
Pizza HutCompany: Yum! Brands, Inc., Yum China Holdings, Inc.Brand Value: $7,364 MillionHeadquarters..
Domino's PizzaCompany: Domino’s Pizza Inc.Brand Value: $7,120 MillionHeadquarters: Ann Arb..
Pall MallCompany: British American Tobacco PLCBrand Value: $7,062 MillionHeadquarters: Winston-Salem..
United AirlinesCompany: United Continental Holdings Inc.Brand Value: $6,958 MillionHeadquarters: Chi..
Universal StudiosCompany: Comcast Corp.Brand Value: $6,708 MillionHeadquarters: Universal City, CACa..
CenturyLinkCompany: CenturyLink Inc.Brand Value: $6,693 MillionHeadquarters: Monroe, LACategory: Tel..
HuggiesCompany: Kimberly-Clark CorpBrand Value: $6,614 MillionHeadquarters: Irving, TXCategory: Baby..
GeicoCompany: Berkshire Hathaway Inc.Brand Value: $6,491 MillionHeadquarters: Chevy Chase, MDCategor..
CliniqueCompany: The Estée Lauder Companies Inc.Brand Value: $6,008 MillionHeadquarters: New ..
KrogerCompany: The Kroger CompanyBrand Value: $5,898 MillionHeadquarters: Cincinnati, OHCatego..
DellCompany: Dell Technologies Inc.Brand Value: $5,788 MillionHeadquarters: Round Rock, TXCategory: ..
TropicanaCompany: PepsiCo Inc.Brand Value: $5,748 MillionHeadquarters: Bradenton, FLCategory: Soft d..
ChipotleCompany: Chipotle Mexican Grill Inc.Brand Value: $5,684 MillionHeadquarters: Denver, COCateg..
Burger KingCompany: Restaurant Brands International Inc.Brand Value: $5,533 MillionHeadquarters: Mia..
SpriteCompany: The Coca-Cola CompanyBrand Value: $5,358 MillionHeadquarters: Atlanta, GACategory: So.. Whole FoodsCompany: Amazon.com Inc.Brand Value: $5,185 MillionHeadquarters: Austin, TXCategory: Reta..
TJ MaxxCompany: TJX Companies, Inc.Brand Value: $4,765 MillionsHeadquarters: Framingham, MACategory:..
ProgressiveCompany: Progressive CorpBrand Value: $4,758 MillionHeadquarters: Mayfield, OHCategory: I..
GatoradeCompany: PepsiCo Inc.Brand Value: $4,694 MillionHeadquarters: Chicago, ILCategory: Soft drin..
Taco BellCompany: Yum! Brands, Inc.Brand Value: $4,661 MillionHeadquarters: Irvine, CACategory: Fast..
Estée LauderCompany: The Estée Lauder Companies Inc.Brand Value: $4,474 MillionHe..
Capital OneCompany: Capital One Financial CorpBrand Value: $4,472 MillionHeadquarters: McLean, Virgi..
Eric Tsytsylin Executive Director, Global Strategy Ogilvy & Mather Eric.Tsytsylin@ogilv..
For brand marketers in consumer-driven healthcare Sheila Mott Vice President, Head o..
Why data needs humans in today’s automobile industry Mike Bentley EVP, Global ..
Gwen Morrison CEO The Store, The Americas WPP's Global Retail Practice Gwen.Morri..
By J. Walker Smith Executive Chairman, Kantar Futures Brands are under pressure to t..
Vincent Roffers Executive Strategy Director Brand Union Vincent.Roffers@brandunio..
Company: Airbnb Headquarter City: San Francisco, CA Industry: Travel / Hospitality Founders..
Game-changing Brands: How the Silicon Valley Mindset Has Transformed Brands, Companies, and Mark..
Google Company: Alphabet Inc. Brand Value: $286,258 Million Category: Technology Headqua..
Apple Company: Apple Inc. Brand Value: $278,919 Million Headquarters: Cupertino, ..
Amazon Company: Amazon.com Inc. Brand Value: $165,256 Million Headquarters: Seatt..
Microsoft Company: Microsoft Corp. Brand Value: $155,404 Million Headquarters: Re..
Facebook Company: Facebook Inc. Brand Value: $151,201 Million Headquarters: Menlo..
Visa Company: Visa Inc. Brand Value: $121,692 Million Headquarters: Foster City, ..
AT&T Company: AT&T Inc. 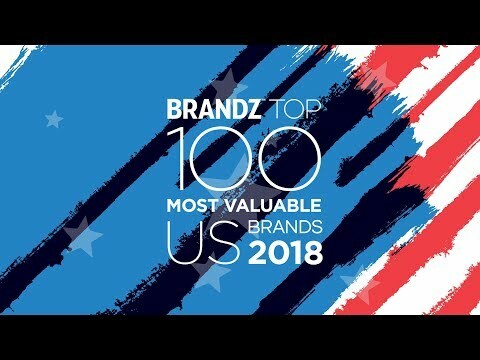 Brand Value: $114,915 Million Headquarters: Dalla..
IBM Company: International Business Machines Corp Brand Value: $102,129 Million H..
McDonald's Company: McDonald's Corp Brand Value: $110,266 Million Headqua..
Marlboro Company: Altria Group, Inc., Philip Morris International Inc. Brand Value: ..
S-Curves – the long and short (term) of brand growth:A conversation between Stephen DiMarco, C..
1. AppleCompany: Apple Inc.Brand Value: $ 316,071 MillionHeadquarters: Cupertino, CACategory: T..
America’s Pastime: The Game of Growthexploring the winning play = innovation + experienceIt&rs..
FedExCompany: FedEx CorpBrand Value: $19,993 MillionHeadquarters: Memphis, TNCategory: Logistic.. It is possible not only to measure the value of brands from the US, but also to assess the strength .. THE VITALITY QUOTIENT (vQ) Just as there are many contributors to human wellbeing, ther.. The Fearsome Five Sitting atop the BrandZ Top 100 Most Valuable United States Brands are 5 techno..
Brandon Geary Global Chief Strategy Officer Possible Brandon.Geary@Possible.com ..
Helaine Klasky U.S. Vice President and Chair, Public Affairs and Crisis Burson-Marsteller H..
By Joline McGoldrick SVP - Marketing and Strategy, Digital and Media Practice Kantar Mi..
By Kevin Singer Partner, Kantar Consulting Kevin.Singer@millwardbrown.com Kevin.Singer@kant..